JANSEN R., FONTIJN D.R., BOURGEOIS Q., BAKELS C.
Social memories and site biographies: construction and perception in non-literate societies (J. Müller) ; The Dutch abroad? Interpreting the distribution of the 'beaker' culture (J. C. Barrett) ; Early Bronze Age boat graves in the British Isles (R. Bradley) ; The nature of a Bronze Age World (A. Harding) ; A triangular Middle Bronze Age trade system of amber, copper and tin 1500-1300 BC (K. Kristiansen, J. Ling) ; Wetland knowledges: resource specialization and denial (C. Evans) ; Maintaining fertility of Bronze Age arable land in the northwest Netherlands (C Bakels) ; Bronze Age ancestral communities – new research of Middle Bronze Age burials in the barrow landscapes of Apeldoorn-Wieselseweg (D. Fontijn, A. Louwen, Q. Bourgeois, L. Smits, C. van der Linde) ; And the river meanders on... 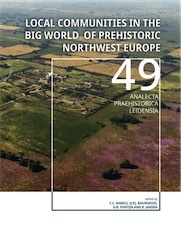 The intertwined habitation and vegetation history of the river area Maaskant and adjacent sand area of Oss (Netherlands) in Late Prehistory till Early Roman Period (R. Jansen, C. Bakels) ; Metal surprises from an Iron Age cemetery in Nijmegen-Noord (P. W. van den Broeke, E. Eimermann).